When I was a young kid, I always looked for my name in the racks of personalized keychains, mugs and other trinkets available wherever young children were the targeted consumer. Fortunately for my parents, I could never find my name. So they did not have to deal with me loudly proclaiming that I absolutely had to have whatever it was that I thought I had to have at the time. What does this have to do with kidlets? 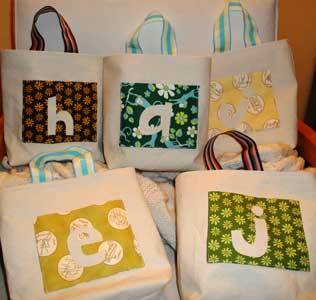 Jennifer Casa of JCasa Handmade has a free tutorial on her blog for kidlets. Essentially small totes that have only one handle to facilitate hanging bags on random hooks and doorknobs to allow kids convenient places to stow stuff. Ingenious, actually. After seeing the tutorial online several years ago, I finally took the time last night to make a few for some kiddies I know and personalized them with the letters of their first names. Better than a keychain, right? I hope the kids like their kidlets. The tutorial recommends using some stiff interfacing to give the kidlets their shape. Because I used canvas for the exterior of the bag I thought the interfacing would be too much. The bags hold their shapes decently, but if I were to make them again, I might make them with interfacing just to see the difference. The exterior pockets give a hint as to the bag's lining. A fat quarter was enough to make the lining and pocket and still have some fabric left over to make a small matching pouch if desired. The letters are cut out from the canvas and fused onto the pockets. In other news, I finished one Christmas present over the weekend. The purple one. Here's a sneak peek at the front. 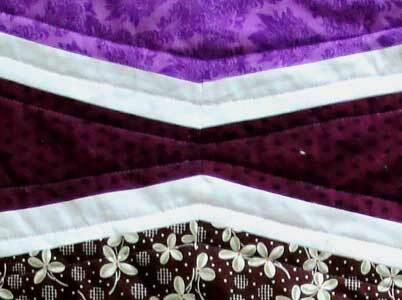 The previous day's post has a sneak peek at the back and the quilting lines. Many thanks to Elizabeth Fransson at Oh, Fransson! for her free pattern for the New Wave Quilt.